Russia recently launched the world’s first floating nuclear power plant out of the St. Petersburg shipyard. Known as Akademik Lomonosov, this floating nuclear reactor is moving toward Western Europe for a controversial maiden voyage. 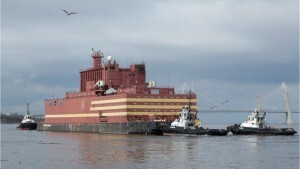 The plant will be towed through the Baltic Sea to a base in Murmansk, a port town in northwest Russia. After arriving at the base the reactor will be loaded up with fuel. However, the final destination for the floating power plant is Pevek, a port town located above the Arctic Circle. (Pevek has the distinction of being known as the northernmost town in Russia.) The plant is planned to begin generating power by the summer of 2019. According to Rosatom Corporation, the company responsible for building Akademik Lomonosov, this plant will replace the Bilibino and Chaunskaya thermal power plants, which are currently providing power to Pevek.